Have you noticed how each class or school send children’s party invitations? There are three different groups. Some flick the date out on whatssapp (my worst – umm hello, I have lost the date before I can say ‘another whatssapp group’), loads use an online tracking service – sorry, I do love my kids and their friends and the convenience of having it all in one spot, but I won’t be paying for a coin for each invitation thank you very much. The majority of parents, send a paper invitation home in the book bag. Yes, this is lovely for the kids and if I was more organised I would put it in my inbox and reply straight away – however often not…. So, when I discovered husband and wife duo (a professional animator and a media producer) who had created Mini Epic as an alternative way of sending kids party invitations – I was very excited! As parents of two young girls, they know the importance of getting invitations done as quickly as possible but also wanted something a little more entertaining than paper or a static image. Party invitations rarely capture the excitement of what’s to come on the big day, so we wanted to create a new kind of invitation that’s entertaining, functional and makes the whole process of sending and managing invitations easier. 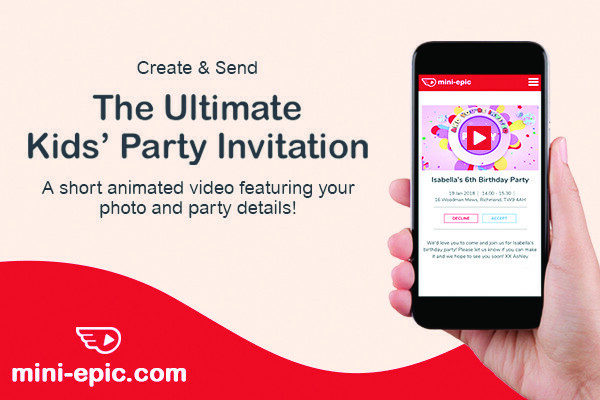 Mini-Epic is a fun and fast way to send online animated party invitations for kids’ parties. Upload a photo and within 60 seconds your personalised invitation is ready to view. and a second son, who would like this invitation – he would watch it on repeat!! And they do adult invitations so I may just be winning in the original stakes when I decide to have a party! Restaurant : Antipodea in Kew Gardens – their Brew Melt is a family favourite for breakfast on a lazy weekend. Hotel : The Dorchester – there’s something special about having afternoon tea there with our daughters once a year. Holiday Destination : New York – we have family across the pond and we always make sure we fly in to the Big Apple – so much to see and do. Shop : Hmmmmm…very difficult to say, but I do like Reiss, my wife’s a fan of H&M and our daughters love Smiggles at the moment. Website : Vimeo – inspiration, inspiration, inspiration! Parenting tip : If you’re serving food at your child’s party, try individual packed paper lunch bags. Not only will each child get the same portion, but you can easily cater to any food allergies and it makes clearing up a whole lot easier too. Oh, and go for juice boxes or small bottles of water – less chance of a spillage! One off £9.99 includes invitation and tracking.